to produce some of the world's finest wines. Most of the world’s highest-rated wines are made in concrete. Concrete delivers the oxygenation of oak without imparting any extraneous flavors to compromise the purity of the wine, and American winemakers are rediscovering this european technique. Concrete: the proof is in the glass. 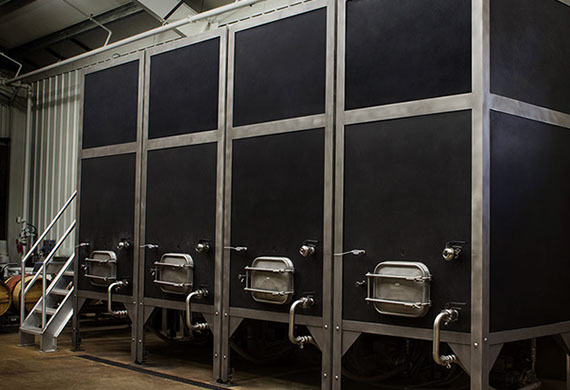 We have been designing and manufacturing concrete fixtures in the California Wine Country for 20 years, and our wine tanks were designed in consultation with the winemakers of this region. Our express purpose was to make the world’s greatest wines. Concrete Wine Tanks for the Fermentation Room and Magnificent Fixtures for the Tasting Room! Designed in consultation with some of the region's premiere winemakers. The egg shape facilitates thorough circulation during fermentation, since there are no corners. Can be configured for red or white wines with a wide range of accessories and options, including embedded tubing for a glycol temperature-control system. The inside casting is done with traditional, colorless concrete made of chlorination-free water, the same formula used for centuries. The outer shell is composed of our exclusive EarthCrete™, a revolutionary, new FiberCast concrete that is both environmentally sustainable and extra strong. The independent, outer shell also permits the egg to be made in a variety of colors, because the pigmented concrete never comes into contact with the wine. We can even emboss or MetalCrete your logo directly onto the concrete, making these intriguing tanks an added attraction for your tasting room or winery tour. Open or closed top. Can be configured for red or white wines with a wide range of accessories and options, including embedded tubing for a glycol temperature-control system. The inside casting is done with traditional, colorless concrete made of chlorination-free water, the same formula used for centuries. The outer shell is composed of our exclusive EarthCrete™, a revolutionary, new FiberCast concrete that is both environmentally sustainable and extra strong. The independent, outer shell also permits the egg to be made in a variety of colors, because the pigmented concrete never comes into contact with the wine. We can even emboss or MetalCrete your logo directly onto the concrete, making these intriguing tanks an added attraction for your tasting room or winery tour. Open or closed top. Can be configured for red or white wines with a wide range of accessories and options, including embedded tubing for a glycol temperature-control system. We can even emboss or MetalCrete your logo directly onto the concrete, making these intriguing tanks an added attraction for your tasting room or winery tour. Open or closed top. Can be configured for red or white wines with a wide range of accessories and options, including embedded tubing for a glycol temperature-control system. The inside casting is done with traditional, colorless concrete made of chlorination-free water, the same formula used for centuries. The outer shell is composed of our exclusive EarthCrete™, a revolutionary, new FiberCast concrete that is both environmentally sustainable and extra strong. The independent, outer shell also permits the tank to be made in a variety of colors, because the pigmented concrete never comes into contact with the wine. We can even emboss or MetalCrete your logo directly onto the concrete, making these intriguing tanks an added attraction for your tasting room or winery tour. Cast in EarthCrete™ Recycled Concrete, Sustainable and UN-stainable! With an organic warmth and feel, concrete has legendary strength, durability and pigment that simply can’t be found in granite and marble. No other structural material can be cast in so many wonderful shapes and colors, and it becomes only more beautiful with age and use. Our Concrete countertops have been received nationwide as the industry’s finest, combining an experienced hand-finishing technique and a keen understanding of the material. The result is a remarkable smooth surface with subtle color variations throughout. Countertops are precast to your specifications for sink openings or integral sinks and faucet holes using any of our Natural or Designer colors or custom color. With this enigmatic creation, water flows down the ramp and vanishes into an obscured slot drain, a natural selection for the most contemporary of buildings or homes, these sinks are reminiscent of Tuscan laundry sinks. Faucet placement and countertops modified to your specification. Our EarthCrete concrete countertops and concrete sinks are sustainable and un-stainable, and now available in genuine MetalCrete finishes of bronze, copper, nickel and pewter. Call us for an estimate. Designed to accommodate 2 to 4 faucets and custom cast in your choice of colors. Our four basin sizes may be placed in any location on countertops up to eight feet in length. No visible hardware, slot drain replaces traditional drain, mounted on standard cabinetry or “floated” between walls. Our EarthCrete concrete countertops and concrete sinks are sustainable and un-stainable, and now available in genuine MetalCrete finishes of bronze, copper, nickel and pewter. Call us for an estimate. Our concrete Wave Sink received the highest honor possible at the National Kitchen and Bath Show being voted Best New Product of the Year by 40,000 kitchen and bath professionals. Perhaps because there is no shape better-suited to the bath than this undulating wave. Sonoma Cast Stone EarthCrete concrete countertops and concrete sinks are sustainable and un-stainable, and now available in genuine MetalCrete finishes of bronze, copper, nickel and pewter. Call us for an estimate. Here's a new option for your concrete countertops and concrete sinks - even tiles, from Sonoma Cast Stone: permanent metal plating, in a dazzling variety of finishes. Our new MetalCrete concrete countertops and sinks do not ring hollow like molded metal. These exquisite kitchen and bathroom fixtures have the feel of solid stone, because that’s what they are: our renowned concrete permanently “plated” with a genuine, metal finish. Choose from real copper, nickel, brass, bronze or steel. And for a truly unique look, we can plate just the sink’s interior. Our concrete tiles and pavers come in a variety of colors, shapes and textures that would defy granite tile or ceramic tile. Concrete allows for the pillow contour of our SoftStone, the delicate patterning of our Bamboo tiles, and glassy smooth face of our SlickStone... and so much more! We offer bathroom tile, floor tile, wall tile and ceiling tile. Find new opportunities painting the rooms with our distinctive palette of colors and textures. We encourage custom tile requests. Sonoma Cast Stone makes interior or exterior cladding in sustainable EarthCrete™ concrete, taken from the landfill and not the land. It's available as classic concrete, stain-free NuCrete™ or MetalCrete™ (shown). With MetalCrete™, the concrete is embedded with powdered metal. Choose from genuine copper, bronze, nickel, steel and more! Lightweight, interlocking panels can vary in size and shape. Going green? Go MetalCrete™. Open or closed top. Can be configured for red or white wines with a wide range of accessories and options, including embedded tubing for a glycol temperature-control system. The inside casting is done with traditional, colorless concrete made of chlorination-free water, the same formula used for centuries. The outer shell is composed of our exclusive EarthCrete, a revolutionary, new FiberCast concrete that is both environmentally sustainable and extra strong. The independent, outer shell also permits the tank to be made in a variety of colors, because the pigmented concrete never comes into contact with the wine. We can even emboss or MetalCrete your logo directly onto the concrete, making these intriguing tanks an added attraction for your tasting room or winery tour. With an organic warmth and feel, concrete has legendary strength, durability and pigment that simply can't be found in granite and marble. No other structural material can be cast in so many wonderful shapes and colors, and it becomes only more beautiful with age and use. Our Concrete countertops have been received nationwide as the industry's finest, combining an experienced hand-finishing technique and a keen understanding of the material. The result is a remarkable smooth surface with subtle color variations throughout. Countertops are precast to your specifications for sink openings or integral sinks and faucet holes using any of our Natural or Designer colors or custom color. All Sonoma Cast Stone countertops and sinks are made from our own EarthCrete concrete, it's sustainable and Un-stainable! Outdoor BBQ and fireplace surrounds create a great environment for guest to enjoy the sceenery and the wine at the same time! Designed to accommodate 2 to 4 faucets and custom cast in your choice of colors. Our four basin sizes may be placed in any location on countertops up to eight feet in length. No visible hardware, slot drain replaces traditional drain, mounted on standard cabinetry or "floated" between walls. Our EarthCrete concrete countertops and concrete sinks are sustainable and un-stainable, and now available in genuine MetalCrete finishes of bronze, copper, nickel and pewter. Call us for an estimate. Here's a new option for your concrete countertops and concrete sinks - even tiles, from Sonoma Cast Stone: permanent metal plating, in a dazzling variety of finishes. Our new MetalCrete concrete countertops and sinks do not ring hollow like molded metal. These exquisite kitchen and bathroom fixtures have the feel of solid stone, because that's what they are: our renowned concrete permanently "plated" with a genuine, metal finish. Choose from real copper, nickel, brass, bronze or steel. And for a truly unique look, we can plate just the sink's interior. Building Concrete Wine Tanks at concretewinetanks. Decorate Your Egg Tank and Win $500 for Easter! Got one or more of our concrete egg tanks? Send us photos of your most inspired Easter Egg decoration. The best photo wins $500! Best photo received by April 25th wins the prize. Can Your Oak Barrel Do This? As with all of our concrete wine tanks, the simplicity of the NuBarrel's appearance belies its feature-rich functionality, superior engineering, and versatility. Whether you need a few tanks for small-batch fermentations or you want to fill a barrel room with stacked NuBarrels™ for large-scale aging, we have the perfect configuration for you. The concrete NuBarrel™ is a reliable work-horse that will give you wine with the superior quality of concrete. It will also last literally decades longer than oak and take up a third less floor space per gallon of wine. (Email Us), call (877) 283-2400, or visit www.concretewinetanks.com to learn more. You will find that concrete NuBarrels™ are much easier to work with than oak barrels. One NuBarrel™ has the same capacity as 4 oak barrels, but you can clean it in a fraction of the time. Cleaning, draining, and even pump-overs can usually be done without even having to move the NuBarrels™! 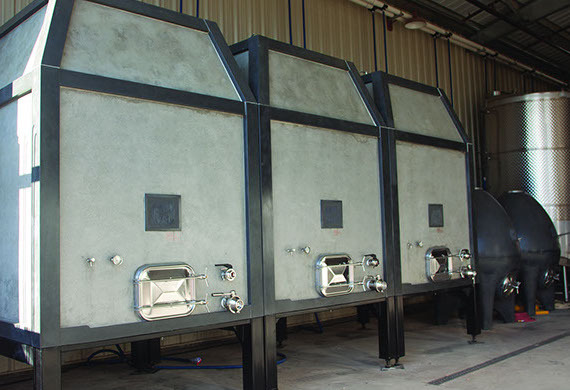 Superior engineering and our unique, concrete-layering system make our tanks incredibly strong and are the reasons why we're the only manufacturer of concrete wine tanks to offer this guarantee. We know how to make a good impression. Visual impact is another aspect of our tanks that sets Sonoma Cast Stone clearly apart. No other manufacturer of concrete wine tanks can do what we do with color and logo treatment. 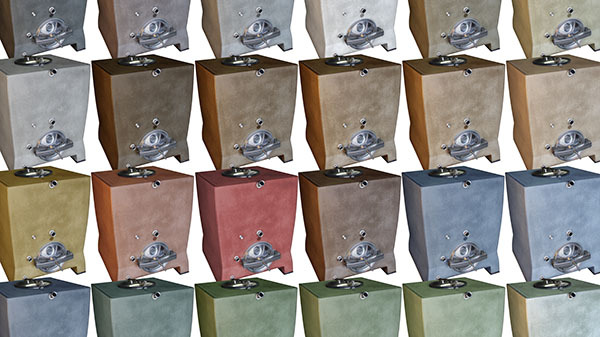 Choose from dozens of natural and designer colors for concrete wine tanks that will proudly showcase your logo and leave your visitors awestruck. Nearly half of direct-to-consumer sales occurs in the tasting room, and winery guest experience is of growing importance. The appearance of these tanks does speak to your visitors about the quality of the wine inside them, and Sonoma Cast Stone tanks are simply stunning. Guaranteed Not to Leak... and So Much More Beautiful! Ask about our new Segment modular tanks with capacities to 28,000 gal. 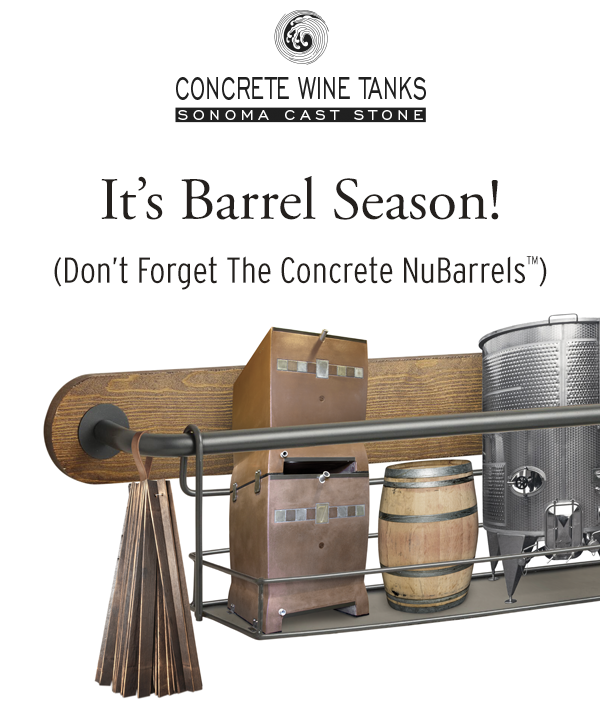 Time to order barrels is time to order concrete NuBarrels™... They last 10 times as long as oak and make better wine! Wine made in concrete is a consistent taste test winner. Concrete oxygenates the wine, while allowing pure fruit flavor with a crisp hint of minerality and enhanced mouthfeel. Last ten times as long as oak barrels, saving millions over the years. Safely bolt together in pairs, requiring a third less floor space than oak. Are much easier to manage and clean than oak barrels. Can be configured for fermentation or storage of red or white wines. Most importantly, concrete makes great tasting wine! One NuBarrel holds the same as four oak barrels, 240 gallons. Winemakers are having great success with wine made in concrete as an essential blending component or as a stand-alone, premium wine. 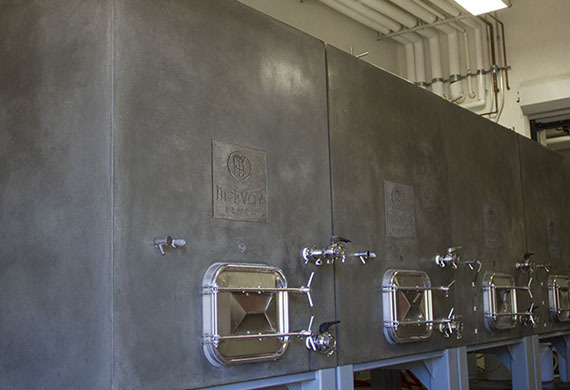 Concrete NuBarrels can be configured for either fermentation or storage of both red and white wines. 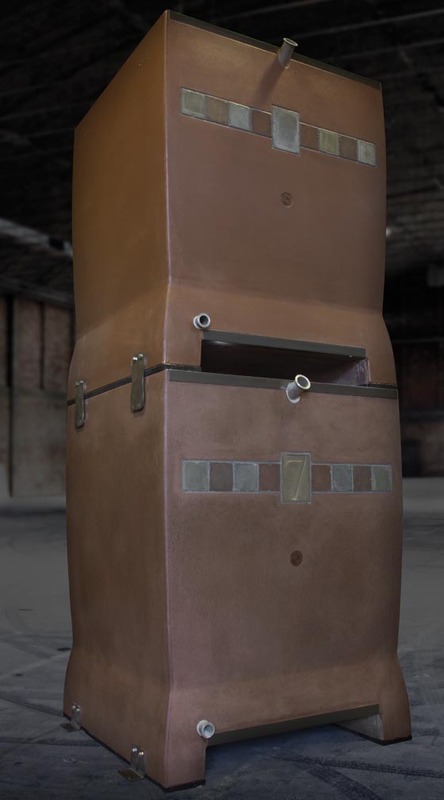 Darren Lange and Master Cask now exclusively represent Sonoma Cast Stone concrete wine and beer tanks in Australia and non-exclusively in New Zealand, Thailand, Indonesia, Malaysia, Taiwan, Singapore, China and Japan. Mr. Lange, founder of Master Cask, has over 30 years of wine industry experience and is an expert in the wine maturation industry. Sonoma Cast Stone is enthusiastic about developing this market with Mr. Lange’s expertise and anticipates significant sales in the high-growth nations of this region. 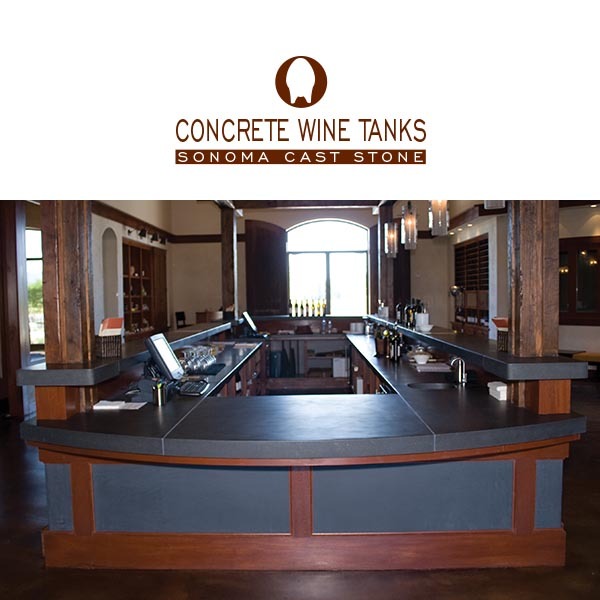 After 20 years of making custom concrete products for the best luxury hotels, restaurants, homes and tasting rooms, Sonoma Cast Stone has become the preeminent manufacturer of concrete wine tanks, and regarded as one of the most innovative companies in the wine industry. Sonoma Cast Stone brings a unique craftsmanship into the design and production of concrete tanks. Located in the California Wine Country, Sonoma Cast Stone has worked directly with premier winemakers to design the most functional and easiest to use tanks available. Te design and finish of its tanks are as remarkable as the tank function. 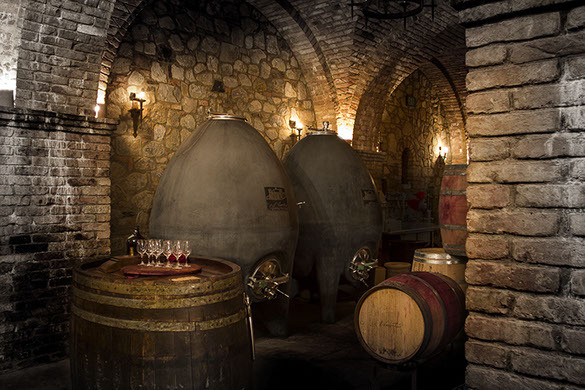 Today Sonoma Cast Stone tanks are shown in tours of America’s finest wineries. We are very happy to bring this exciting product line to Australia, New Zealand, and Southeast Asia and to have Mr. Lange to represent us there. 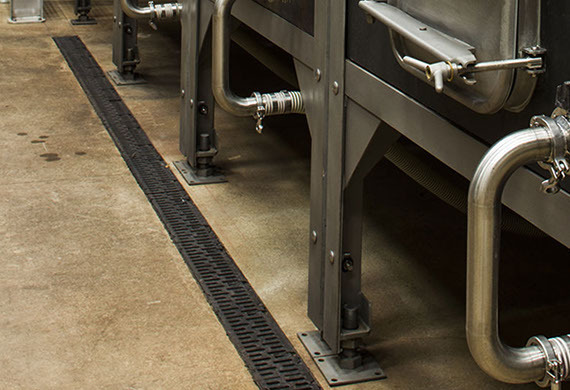 The steel manway covers on top of large fermentation tanks can weigh as much as thirty pounds, and working with these heavy fixtures often involves reaching awkwardly across an elevated position from a ladder or catwalk. As one winemaker put it, "I have guys who go 5' 3" and a buck-twenty. I don't want them leaning across the top of one of these tanks and trying to lift 30 pounds of steel." Sonoma Cast Stone is known for innovation and for listening to winemakers. 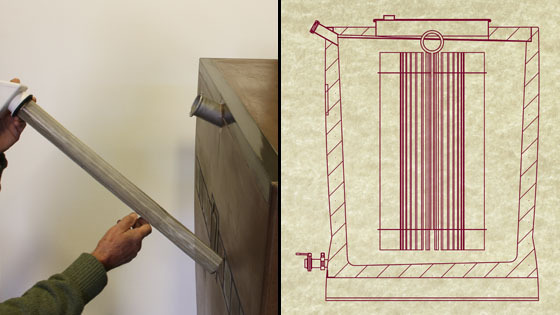 For our concrete wine tanks, we developed a new manway cover that you could literally operate with one finger. In use already at Sterling Vineyards, this ingenious design functions by simply turning a wheel to raise the cover a fraction of an inch, then pushing the raised lid gently around a pivot point. For more informations visit concretewinetanks.com or contact Sonoma Cast Stone. Taste test after taste test has proven the superior quality of wine fermented in concrete. Concrete gives you the best of oak and steel and allows the wine to showcase its true terroir with pure fruit that is not obscured by unwanted flavors. 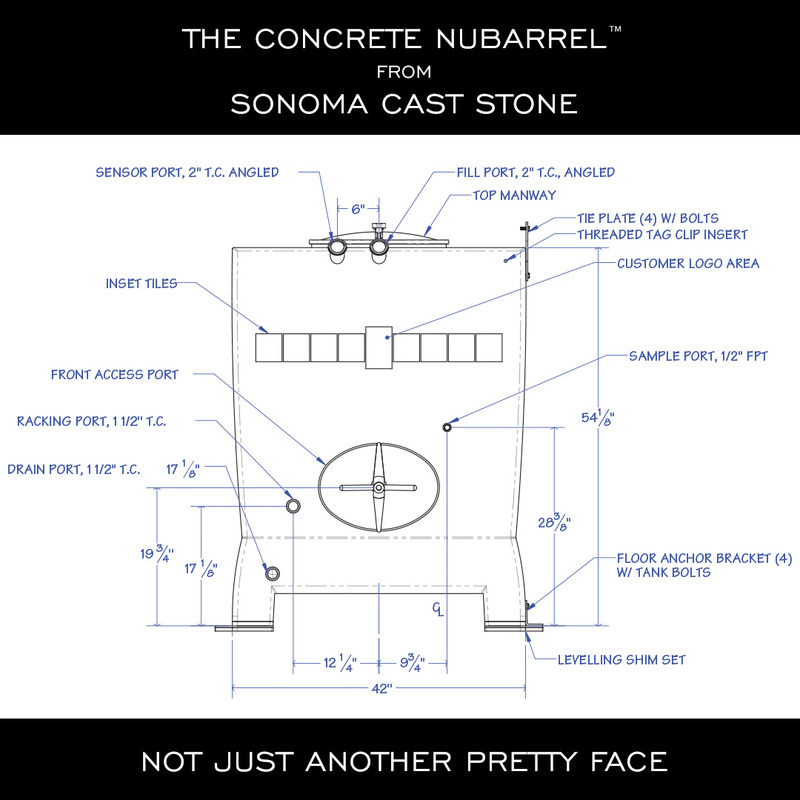 Now, the concrete NuBarrel™ from Sonoma Cast Stone offers designs for either fermentation or aging, so that you can maintain that high level of quality all the way through bottling. Sonoma Cast Stone is pleased to announce that James W. Herwatt has accepted the position as its new CEO. James brings to Sonoma Cast Stone over thirty years of experience in the wine industry, including the past twenty-two years that James successfully lead Cork Supply USA and Tonnellerie O. “This is a great opportunity to be working with Steve Rosenblatt and the entire Sonoma Cast Stone team to help expand concrete tank and barrel sales in the United States and throughout the world,” said James Herwatt. 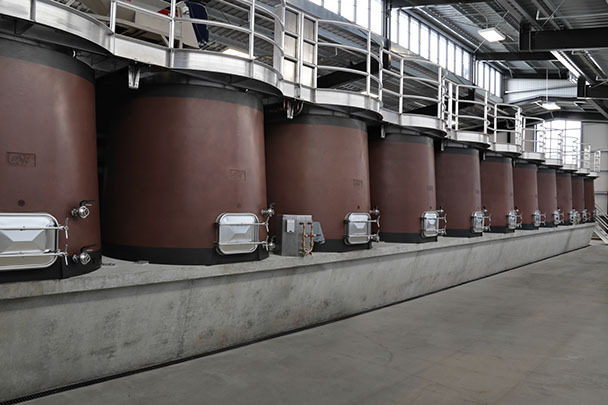 Sonoma Cast Stone, the preeminent manufacturer of concrete wine tanks and barrels, has become regarded as one of the most innovative companies in the wine industry. After 20 years of making custom concrete products for the best luxury hotels, restaurants, homes and tasting rooms, Sonoma Cast Stone brings a unique craftsmanship into the production of making concrete tanks. Sonoma Cast Stone also perfected the art of listening. Located in the California Wine Country, Sonoma Cast Stone has worked directly with premier winemakers to design the most functional and easiest to use tanks available. All winery products are designed with the understanding that the design and finish of its tanks are as important as the tank function. 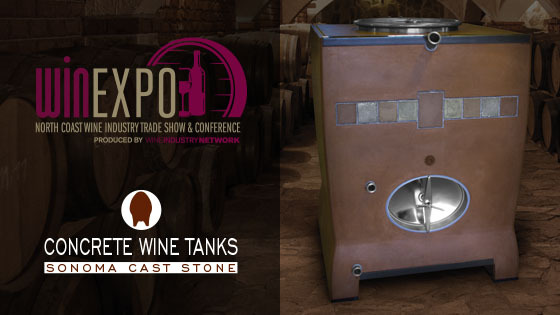 Today Sonoma Cast Stone tanks are shown off as part of the tour found in many of Americas finest wineries. We are very happy to see James take a leadership role in this direction. Every spring, Sonoma Cast Stone has a tank decorating contest. It was inspired by Easter Eggs and our egg tanks, but anyone with one of our tanks can enter. Go for it! Decorate your tanks, and send the photos to: steve@sonomastone.com, by April 14th, along with your permission to display them. The Sonoma Cast Stone brain trust will judiciously evaluate your creativity, over some fine Sonoma County wine, and promptly announce the results. The best tank decorator in the land will then received $500, and all the associated bragging rights thereby pertaining. 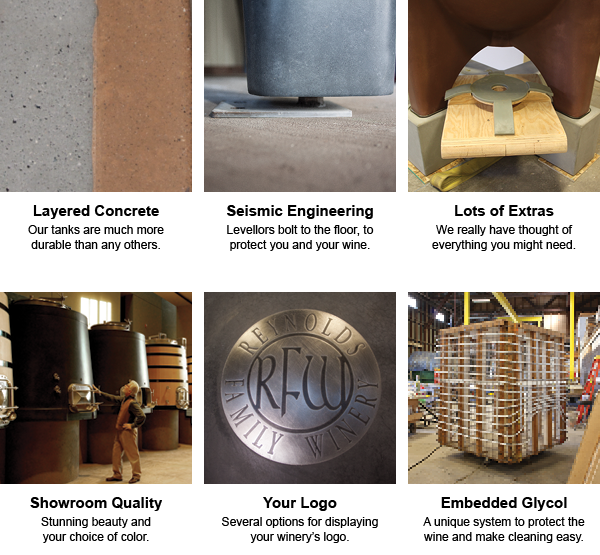 (Click Here) to see the stunning, concrete fixtures that can enhance your winery. A celebrated wine is greatly enhanced by an exquisite winery. Concrete, like wine, is a molded product of the earth. With concrete you get substance, warmth, and a beauty not possible in other materials. Although known for our concrete tanks, we would like to remind you of some of the other winery products we have been making for the past 20 years. 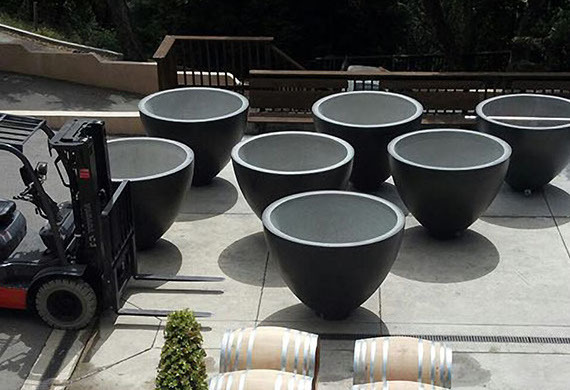 Steve Rosenblatt, CEO of Sonoma Cast Stone, the manufacturers of Concrete NuBarrel™, is on a mission to demonstrate the superiority of his product over oak barrels in an industry steeped in tradition. He appears to be succeeding. “Concrete has become the darling of high-end wines everywhere,” In Europe Rosenblatt attests, upwards of 80 percent of premium wine is now being made in concrete. He says that interest in the U.S. is growing, and attributes the shift to innovative products like that of his concrete NuBarrel™. The Sonoma Cast Stone design team carefully studied the traditional dependence on costly oak barrels and determined that a smart barrel can reproduce the tannins, color and taste of an oak barrel and at the same time reduce the cost and increase the winemaker or cellar master’s control over the aging process. The NuBarrel™ is perfect for the growing trend of un-oaked chardonnay. If oak is desired the vessels can be outfitted with either an immersion sleeve, filled with oak cubes or chips for subtle oak influence, or a full stave rack for extensive oak flavoring. In this way, the tank design gives the winemaker complete control over the desired level of oak character imparted to the wine. When complete, the oak tube or rack can be easily removed with the wine left, undistributed in this concrete tank. “The winemaker has so much more control with a NuBarrel™ than with traditional oak,” Rosenblatt points out. “All of our products are handcrafted, and yet very high-tech. Unlike other concrete tanks, all of our fermenting and storage tanks are fully guaranteed not to crack or leak for ten years. When properly managed these tanks will last up to four decades. This could be a savings of over a million dollars a year for a moderate size winery. Concrete NuBarrels™ hold 240 gallons each, four times the amount of a standard, 60-gallon oak barrel. Engineered with an eye toward maximizing cellar storage, NuBarrels™ occupy the space of just one and one-half oak barrels, with quadruple the juice capacity. Micro oxygenation occurs naturally but uncontrollably in oak barrels. To give this same result, the NuBarrel™ has a stainless steel sparging stone that can give the exact amount of oxygen when needed, to the aging wine. 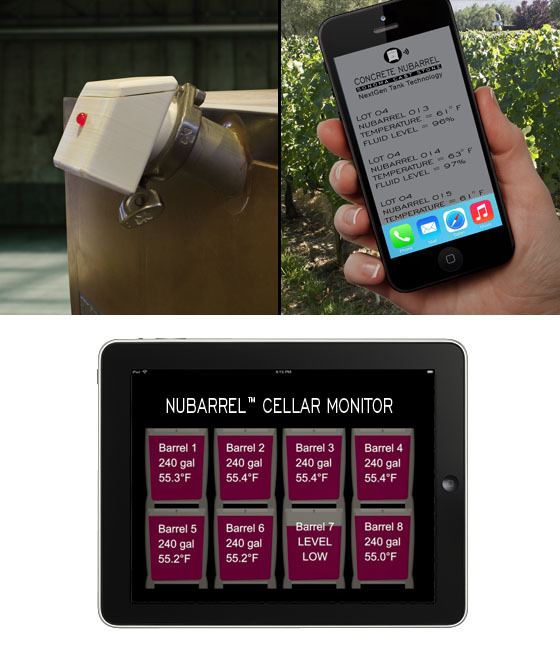 Each Concrete NuBarrel™ can have a temperature gauge and fluid level monitor, which can be connected to a cell phone and alert the cellar and winemaking team if something in the tank is amiss. 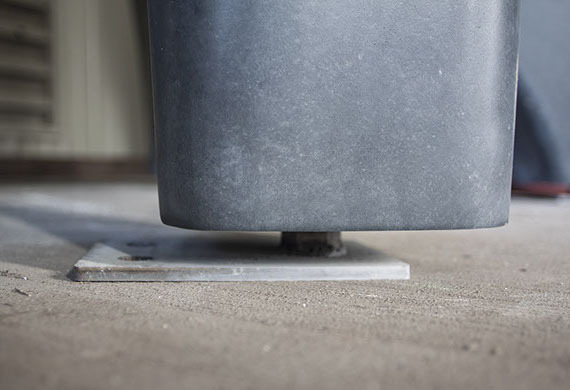 Concrete NuBarrels stack in pairs, with a capacity of eight barrels, bolt together and can be attached to a concrete floor, providing maximum stability in the cellar. The design was tested at the University of California Berkeley earthquake testing center and has exceeded all standards, both free-standing and bolted down. 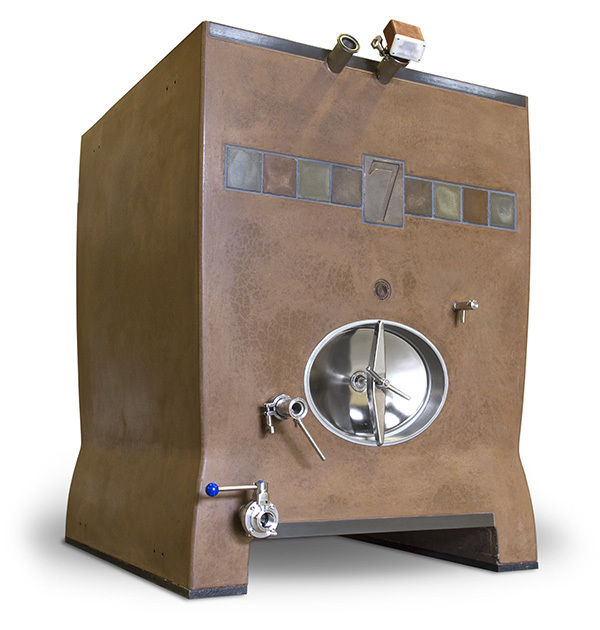 Small wineries and large wineries with overflow or small, experimental lots can use the NuBarrel™ as a concrete fermenter. Winemakers who are anxious to try their grapes in increasingly popular concrete will find that it is an ideal tank for both the making and aging of both red and white wines. 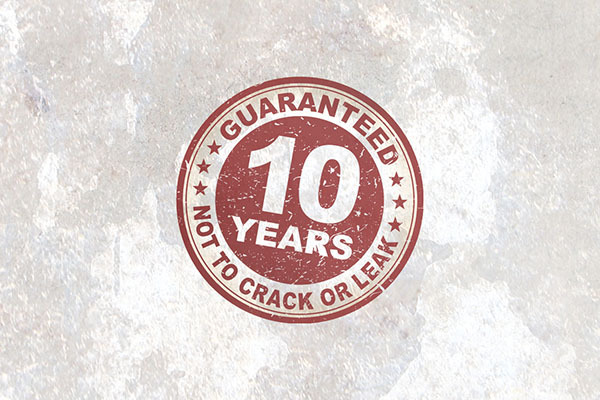 Sonoma Cast Stone is so confident of its product that it is the only manufacturer to offer a ten-year warranty against structural cracking or leaking of its concrete tanks. Expensive oak barrels last an average of four years. With adequate care, concrete tanks could last 40 years, bringing that cost down dramatically. One concrete NuBarrel™ produces the wine of 40 oak barrels. The replacement of oak barrels, every 4 years, is one of a winery’s highest operating costs. This stackable, concrete NuBarrel™ will last four decades at a cost substantially lower than wooden barrels. From every aspect the NuBarrel™ gives the winemaker total control over the aging process. The concrete NuBarrel™ requires far less storage space and less handling costs. After hundreds of years of old wooden barrels – it’s time for a fresh look at what an innovative barrel can really do for the wine making process. (Click Here) to inquire, or call: (888) 807-4575. How Much Oak Do You Want? Zero oak? A little oak? A little more? Concrete NuBarrels™ from Sonoma Cast Stone give you complete control of the oak character in your wine with two options. Above left is our immersion sleeve which allows you to simply and easily introduce and withdraw oak chips as you like. Above right is our immersion rack which lives within your concrete NuBarrel™, properly exposing the oak you place in it. Unlike an oak barrel, this oak stave center can be removed once the oak is no longer of value. Ever wonder what's really going on in there? Internal sensors let you "see" inside your concrete NuBarrels™, and more than that, they will alert you when conditions stray from where you want them to be. Anyone in the barrel room can see the alert on the tank (above left), and the sensor will actually communicate with your handheld phone or tablet. 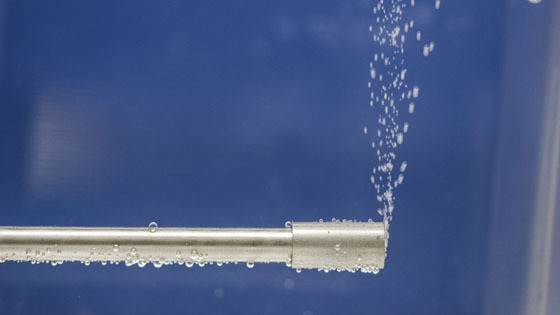 This adjustable stainless steel insert provides a steady stream of micro-bubbles. Never before have winemakers had this much control over such a vital component in the overall process of fermentation. See this in action at the WinExpo, December 3rd! How much do you really spend on storing wine? Fermentation is concrete is an old-world practice that has been eagerly embraced by today's winemakers. Many of the world’s finest wines are made in concrete tanks. Now you can extend the inherent value of concrete into the aging process. A single concrete NuBarrel™ holds as much wine as four oak barrels and surprisingly costs significantly less over the lifespan. Add to that the cost of storage space and constant handling and stirring of individual barrels. You would think that this great of a savings is done at the expense of making quality wine. The truth is just the opposite. Being able to monitor and control every aspect of the aging process should add to the value of any wine. Look For Us at WinExpo, December 3rd! We are planning on an early harvest this year and have a considerable tank backlog. Concrete tanks ordered by April 1, will have a guaranteed delivery before August 1st. Tank orders placed after April 1, might be delivered in time for this year’s crush, if possible. 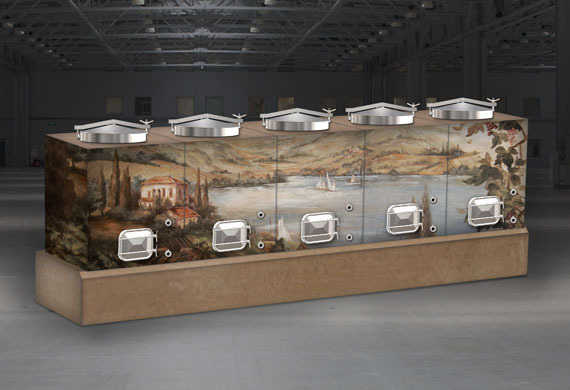 See 2015 Concept Tanks from our drawing board! At Sonoma Cast Stone, innovation is our passion, and we hope that these ideas leave you similarly inspired. Concrete does wonderful things for wine, ultimately showcasing the wine's true terroir. Sonoma Cast Stone has been doing wonderful things with concrete for 20 years, and we would love to put some of your inspiration into development. Let us know when you're ready. (Click here) to see our best ideas for 2015. We are in the heart of the California wine country... and the same geological fault system as you, so we take seismic engineering seriously. 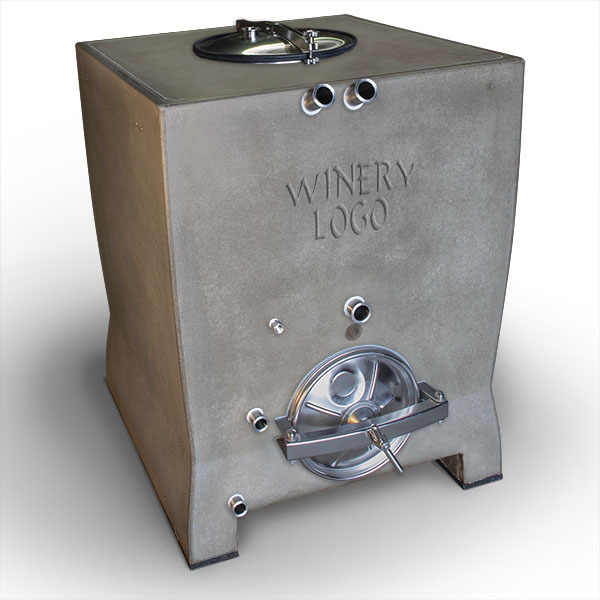 We offer bolt-down feet on all of our concrete wine tanks and their optional, steel frames to keep you and your wines safe. The adjustable feet also serve to level your concrete wine tanks. 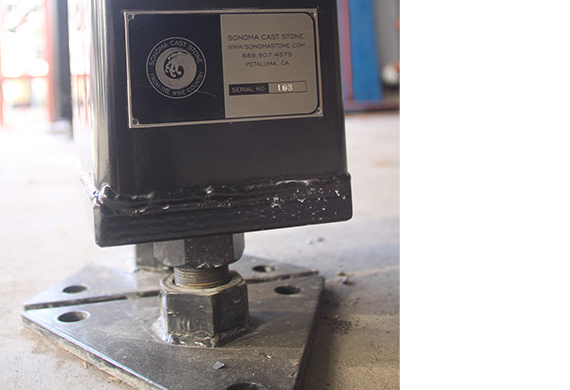 This kind of expertise allows Sonoma Cast Stone to stand behind our concrete fermentors with the industry's only guarantee against structural cracking. We have been in the California Wine Country for 20 years, and our wine tanks were designed in consultation with the regional winemakers here with the express purpose of making the world's greatest wine tanks... and the world's greatest wines. All Sonoma Cast Stone products are made in America. The egg shape facilitates thorough circulation during fermentation, since there are no corners. Can be configured for red or white wines with a wide range of accessories and options, including embedded tubing for a glycol temperature-control system. The inside casting is done with traditional, colorless concrete made of chlorination-free water, the same formula used for centuries. The outer shell is composed of our exclusive EarthCreteâ"¢, a revolutionary, new FiberCast concrete that is both environmentally sustainable and extra strong. The independent, outer shell also permits the egg to be made in a variety of colors, because the pigmented concrete never comes into contact with the wine. We can even emboss or MetalCrete your logo directly onto the concrete, making these intriguing tanks an added attraction for your tasting room or winery tour. Open or closed top. Can be configured for red or white wines with a wide range of accessories and options, including embedded tubing for a glycol temperature-control system. The inside casting is done with traditional, colorless concrete made of chlorination-free water, the same formula used for centuries. The outer shell is composed of our exclusive EarthCreteâ"¢, a revolutionary, new FiberCast concrete that is both environmentally sustainable and extra strong. The independent, outer shell also permits the egg to be made in a variety of colors, because the pigmented concrete never comes into contact with the wine. We can even emboss or MetalCrete your logo directly onto the concrete, making these intriguing tanks an added attraction for your tasting room or winery tour. Open or closed top. Can be configured for red or white wines with a wide range of accessories and options, including embedded tubing for a glycol temperature-control system. The inside casting is done with traditional, colorless concrete made of chlorination-free water, the same formula used for centuries. The outer shell is composed of our exclusive EarthCreteâ"¢, a revolutionary, new FiberCast concrete that is both environmentally sustainable and extra strong. The independent, outer shell also permits the tank to be made in a variety of colors, because the pigmented concrete never comes into contact with the wine. We can even emboss or MetalCrete your logo directly onto the concrete, making these intriguing tanks an added attraction for your tasting room or winery tour.